“Gut bacteria get to use a lot of our food before we do,” says Federico Rey, a professor of bacteriology at the University of Wisconsin–Madison. Then we get their leftovers — or their waste. The problem, says Rey, is that if our microbiome overindulges, we might not have access to the nutrients we need. That’s the suggestion from new research conducted by Rey’s group that shows mice that harbor high levels of microbes that eat choline are deprived of this essential nutrient. 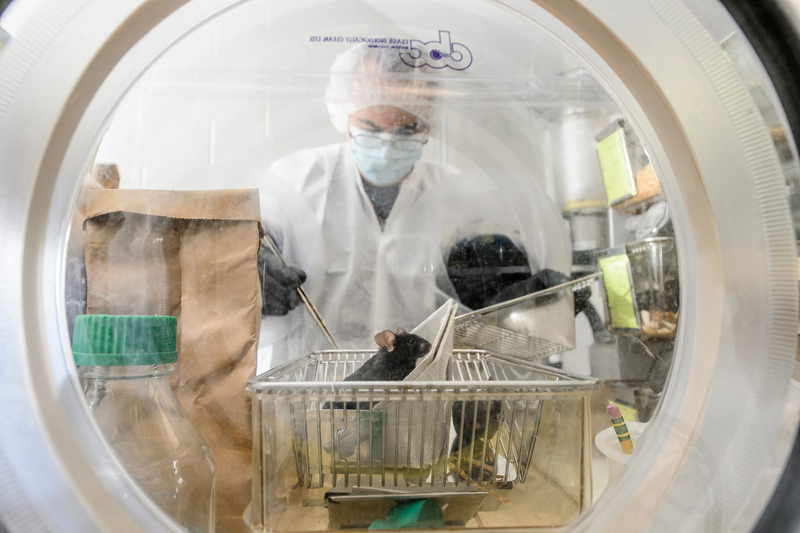 Compared to mice without choline-hungry bacteria, the choline-starved mice had an increased susceptibility to metabolic diseases and gave birth to pups with biochemical alterations in the brain and that exhibited more anxious behaviors. The study is published this week in Cell Host & Microbe. UW–Madison Professor of Bacteriology Daniel Amador-Noguez and researchers from Harvard University also contributed to the work. Epigenetic regulation — the decorating of genes with chemical groups that control how much they are expressed — appears to underlie the effects of gut bacteria that consume too much choline. Choline contributes to the pool of resources that cells use to make these modifications to DNA, and with less choline available, the cell’s ability to modify and regulate genes can be impaired. Tissues from the liver to the brain had altered epigenetic patterns in mice with high levels of choline-eating microbes. Estimates suggest that only about 10 percent of the U.S. population, including pregnant women, meets the recommended dietary intake of choline. The nutritional demand for the nutrient increases during pregnancy to support epigenetic regulation and cellular health in the developing fetus, and studies have linked choline deficiency during pregnancy in humans with altered behavior in children. Choline is found in high amounts in soybeans, eggs, meat, fish, cauliflower, milk and other foods. To test whether microbiomes could compete with their hosts for this essential nutrient, Rey’s group used germ-free mice that were colonized with defined populations of microbes. Some mice had choline eaters; others had communities where choline consumption was disrupted by mutating a single gene. When Romano fed the mice a high-fat diet, which induces a range of metabolic diseases in mice, the animals with choline-eating microbes added more abdominal fat, and had fattier livers, than their counterparts with microbes that couldn’t eat choline. Since pregnancy creates a high demand for choline, Rey’s team also tested the effects of choline-eating microbes across generations. Romano found that the offspring of mice with choline-eating bacteria had altered epigenetic patterns in their brains, suggesting problems with normal development. In mice that were genetically susceptible to behavioral problems, those that had choline-eating microbes showed more anxious behaviors, like burying marbles in their cages. Mothers showed increased levels of infanticide and obsessive grooming, also indicative of increased anxiety. “There are already human studies that show that choline deficiency is a problem that matters to human health, and what this study really provides is one possible mechanism by which this may be exacerbated,” says Rey. Although Rey’s team suspects that epigenetic regulation partly explains the negative effects of choline-eating microbiomes, the byproduct of bacterial choline metabolism, known as TMAO, is also linked to negative outcomes. In their experiments, Rey’s lab observed much higher levels of TMAO in the mice that hosted choline-eating bacteria. The toxic TMAO might work together with disrupted epigenetic patterns to create the long list of metabolic and developmental disruptions seen in these animals. The toxic effects of TMAO accumulation also complicate potential dietary remedies — more choline in the diet might lead to more TMAO rather than fixing nutritional shortages. While this work suggests that the complex link between nutrition, gut microbes, and host metabolism is vital for health, many questions remain about how to improve outcomes, either in mice or in humans. “As any good science project goes, we scratched the surface of an answer but open up a million more doors to go through,” says Romano. This work was supported in part by the National Institutes of Health (grant DK108259), a Smith Family Award for Biomedical Research, a Packard Fellowship for Science and Engineering, and a Blavatnik Biomedical Accelerator Award. This material is based upon work that is supported by the National Institute of Food and Agriculture, U.S. Department of Agriculture (grant WIS01910), and Hatch (grant WIS01901).